Anna Glendenning is a PhD candidate from Roehampton’s Centre for Research in Romanticism, who works on caricature. She reports here on the Romantic Illustration Network’s collaboration with the House of Illustration on a workshop for Y8 pupils, supported by the University of Roehampton. On Thursday 3rd December, the House of Illustration in King’s Cross London was home to an exciting day of collaboration between local schoolchildren, RIN member Dr. Mary L. Shannon from the University of Roehampton, and professional illustrator Merlin Evans. A group of thirty girls aged 12-13 (from Elizabeth Garrett Anderson School in Islington) braved a suitably chilly winter’s morning to visit the House of Illustration, where they immersed themselves in a special workshop on Dickens’s A Christmas Carol . I also got to help out: it was hugely enjoyable to be part of such an inspiring day of interdisciplinary fun. For the full photostory, see http://www.roehampton.ac.uk/Courses/English-and-Creative-Writing/News/There-s-no-Bah-Humbug-this-Christmas-for-pupils-at-illustration-workshop/. “The Second of The Three Spirits” or “Scrooge’s third Visitor” John Leech 1843 Steel engraving, hand-coloured 12.2 cm x 8.3 cm vignetted Fifth illustration in A Christmas Carol (London: Chapman and Hall, 1843), facing p. 78. The fifth illustration is John Leech’s introduction to literature of that “pre-Father Christmas” figure, the Spirit of Christmas Present, not quite sitting on a “couch” or “kind of throne” (77), but decidedly “a jolly Giant, glorious to see; who [bears] a glowing torch, in shape not unlike Plenty’s horn” (77). http://www.victorianweb.org/art/illustration/carol/5.html Scanned image and text by Philip V. Allingham. Dickens’ text has long been a favourite in English classrooms, but it was the aim of this collaboration to give the girls a unique opportunity to explore the crucial role of illustrations – both conceptually and creatively – with two experts. The HOI’s learning programme, with Head of Education Emily Jost at its helm, is dedicated to bringing illustrations into the limelight. Its core aim is to enhance knowledge of and confidence in visual communication for all. The Romantic Illustration Network (RIN) shares this enthusiasm. RIN’s project to restore the importance of visual culture in the Romantic period involves a commitment to sharing and to promoting access to the research it undertakes. Mary Shannon, who specializes in Victorian print culture and is a Dickens expert, led a lively session. By contrasting different illustrations of Scrooge with Dickens’s narrative, trying out their own sketches, and learning from Shannon about Victorian Christmas traditions, the girls contributed lots of compelling thoughts and critiques, expanding their understanding of the relationship between illustrations and Dickens’s text. After taking a look at the House of Illustration’s current exhibition, the girls returned to the studio for a special session with Merlin Evans. Evans brought in tools from her trade and shared some different techniques of collage-making and line work to help the girls to get to grips with the material qualities of producing images. The girls rummaged through photocopies of Victorian illustrations and had the chance to try out the new drawing methods Evans had demonstrated. The results were exquisite. The girls were able to compare their work with the earlier sketches they had made – a great way to show how their understanding of Scrooge’s character had developed over the course of the workshop, and, hopefully, to boost their illustration skills and confidence into the future. Future collaborative workshops involving RIN’s Professor Ian Haywood (Roehampton) and Dr Susan Matthews (Roehampton) are in the pipeline, so watch this space in the New Year! 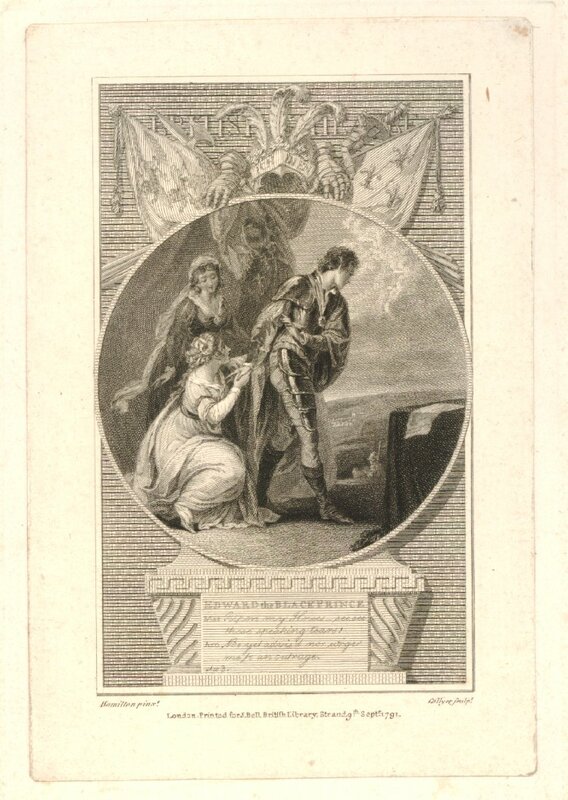 Illustration to William Shirley’s ‘Edward the Black Prince’, scene 3, from Bell’s ‘British Theatre’ series; sheet trimmed and pasted within platemark in imitation of an india proof. 1792. ‘This image, engraved by Joseph Collyer after William Hamilton, is an illustration of William Shirley’s historical tragedy Edward the Black Prince; or, the Battle of Poictiers. 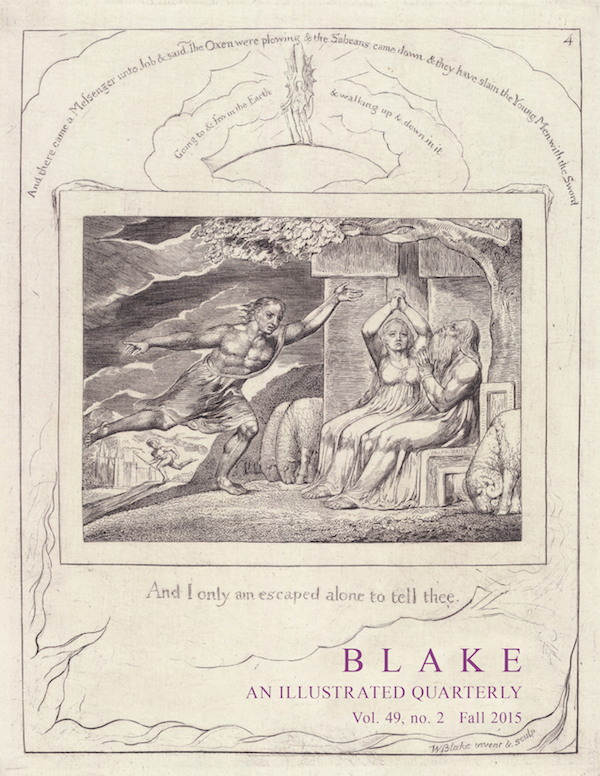 It is taken from the 1791 edition of the play in the hugely popular series Bell’s British Theatre. 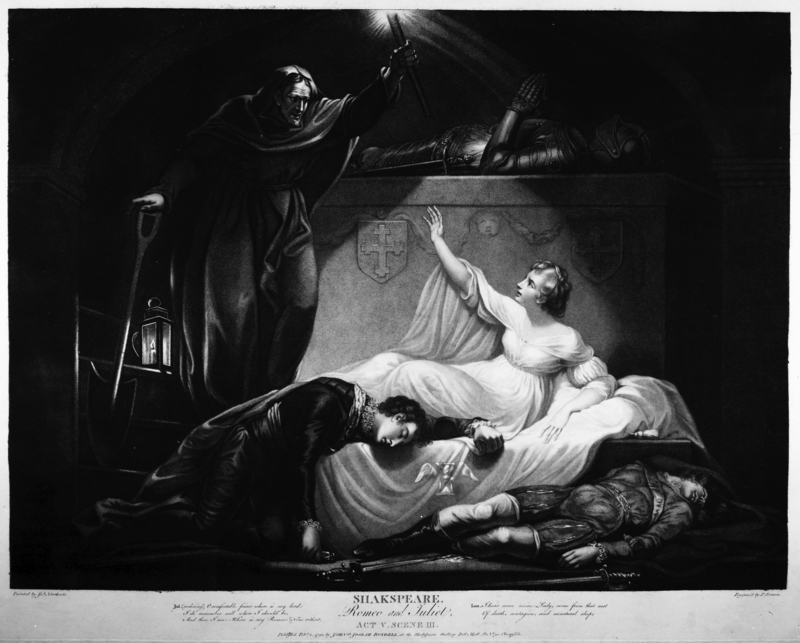 Shirley’s play, “attempted after the Manner of Shakespear”, was first performed in 1750 and remained popular thanks to its combination of romance and heroic action. It is based on the Battle of Poitiers (1356) and stages the Black Prince as a charismatic military leader and a tender friend. A second plot focuses on the tragic love between English knight Arnold and his French prisoner Mariana. The play afforded moments of heroism and of pathos, as well as opportunities for political parallelisms and medieval pageantry. As an illustrator, Hamilton contributed to all the major literary and historical galleries of the period. In the 1780s and 1790s he realised several vignettes and portraits for Bell’s British Theatre. The passage illustrated takes place in Act III, when Mariana and Arnold have defected to the French camp, but Arnold feels remorse at betraying his country and the Prince’s friendship. He resolves to leave Mariana and return to the English camp. Mariana, whose violent passion constantly places her on the brink of madness, attempts to prevent his departure. The costume in Hamilton’s scene evinces a combination of styles. Mariana’s dress is rather Baroque in style, but the high waists of the ladies’ dresses correspond to the fashion of the 1790s. The slashed sleeves and ruffled collar of Mariana’s attendant are historicising details commonly found in eighteenth-century theatrical costuming to signify an earlier historical period, from the Middle Ages to the seventeenth century. For Hamilton, slashed sleeves seem to be a prerequisite to the illustration of the past. Arnold’s costume is inspired by seventeenth-century rather than medieval armour. By the end of the eighteenth century, few works on costume and armour had been published in Britain, and historical painters often sought inspiration from the armouries in the Tower of London – but none of the exhibits were older than the sixteenth century. What the image achieves is an evocation of the past as the background for the sentimental drama, rather than an archaeological reconstruction of the middle ages. The function of referring to the fourteenth century with more precision is devoted to the image’s frame: there we find direct allusions to France and England, in the form of an elaborate display of arms, armour and standards. The display has both a decorative and a narrative function. It features the banners of England and France along with a pike, a sword and a pair of gauntlets, on either side of a helmet crowned with the three ostrich feathers of the Prince of Wales and bearing his motto “Ich dien”. The frame firmly reinforces the political drama unfolding in the background, suggesting that the situation depicted originates in the political choices of monarchs, or conversely, that individual, private decisions can affect events in the political sphere. The hangings in the picture seem to merge with the armorial display of the frame, which reinforces the connection between the sentimental and the historical plots. The gauntlets on either side of the helmet appear to be holding the picture, as if presenting the image to the viewer, or exerting control over the scene. The slightly ominous gauntlets, shadow under the helmet and agitated clouds (which seem a continuation of the French standard) suggest that war will get the upper hand over the lovers. See Jeffrey Kahan, Shakespeare Imitations, Parodies and Forgeries, 1710-1820 (Taylor & Francis, 2004), vol. 1. Diana De Marly, Costume on the Stage 1600-1940 (London: Batsford, 1982), pp.52-23.